If you love Japanese Music, Japanese Culture, Japanese Girls (who doesn’t), Japanese Food (Takoyaki.. wait, thats a snack isn’t it), Japanese Girls (I have to mention this at least twice), Japanese Beer, Japanese Snacks (Edamame), Japanese Girls in Yukata (MOE!) and you’re so fortunate that you live in Perth, Western Australia, then you HAVE to come to Japanite! It’s like everything that you love packed in one for yours truly ! 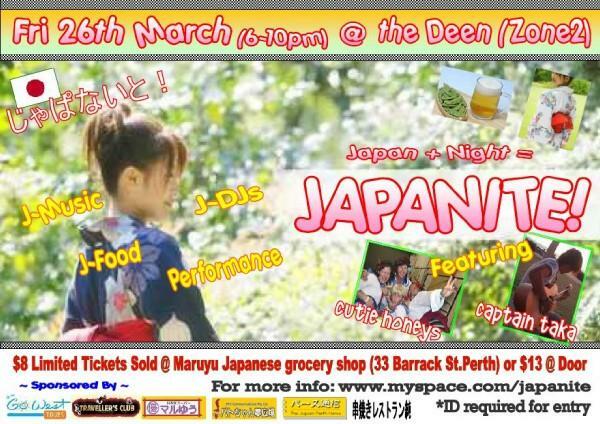 The gate opens @ 6pm and limited advance tickets are sold @ Maru Yu japanese supermarket on 33 Barrack Street, Perth. Japanite, Lifestyle, Northbridge, Perth, The Deen.